/car·dio·pul·mo·nary/ (kahr″de-o-pool´mah-nar-e) pertaining to the heart and lungs. Of, relating to, or involving both the heart and the lungs. Pertaining to the heart and the lungs. Relating to the heart and the lungs. adj pertaining to the heart and lungs. 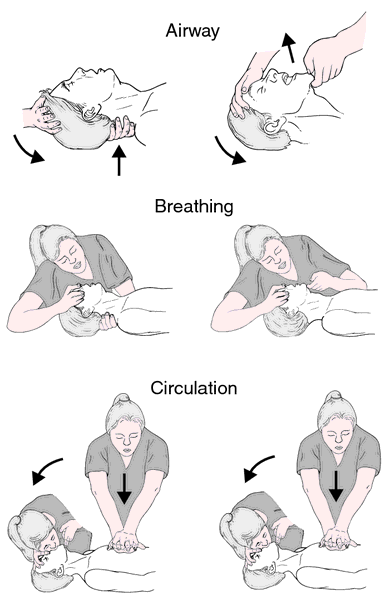 n a basic emergency procedure for life support, consisting of mainly manual external cardiac massage and some artificial respiration. n any one of a number of abnormal conditions that involve dysfunction of the heart and blood vessels, including but not limited to systemic hypertension, atherosclerosis and coronary heart disease, and rheumatic heart disease. cessation of effective external respiration and beating of the heart. The common causes in animals are inadequate ventilation, caused by general anesthetic, thoracic trauma, airway obstruction, and impediments to movement of the lung, thoracic wall or diaphragm, acidemia, hypotension, electrolyte imbalance, or extreme changes in body temperature (hypothermia, hyperthermia). the re-establishment of heart and lung action. The basic steps are: Airway, Breathing, Circulation. A patent airway must be established and maintained; any obstruction is relieved and an endotracheal or tracheostomy tube inserted. Adequate ventilation with oxygen is provided by intermittent positive pressure and, if required, cardiac (chest) compression or massage is commenced. A. Sorry to hear about your brother being so miserable with his symptoms, and the apparent distress it understandably is causing you. With sunlight bothering him, that is called photophobia and is a symptom of certain types of lupus, or can be an effect from a medication he may be taking. The swelling on his neck may be due to hyperthyroidism, asthma, or an allergic reaction perhaps to prednisone, which is given to lupus patients. You should get your bother to see a doctor soon, if you have not already. You don't want him to stop breathing or anything. Attitudes of patients toward cardiopulmonary resuscitation in the dialysis unit. Cardiopulmonary manifestations of hantavirus pulmonary syndrome. KEY WORDS: Cardiopulmonary Bypass, Isosorbide Dinitrate, Propofol. These product offerings will enrich LivaNovas cardiopulmonary temporary support capabilities. TandemLife products have provided critical cardiopulmonary support to thousands of patients in the top hospitals worldwide. After two years of collecting and submitting data and writing new policies and procedures, we were informed that we met all of the requirements to be certified," said Lisa Smith, RRT, RCP, Director of Cardiopulmonary for Marshall Browning Hospital. Very few studies have focused on the intraoperative and postoperative risk factors responsible for the development of pulmonary complications in patients undergoing cardiac surgery using cardiopulmonary bypass. Outcome with high blood lactate levels during cardiopulmonary bypass in adult cardiac operation. Key Words: Cardiopulmonary arrest (CPA), Basic Life Support(BLS),Medical Emergency (ME) Cardiopulmonary Resuscitation (CPR). First to devise clinical guidelines establishing how to best treat cardiopulmonary arrest in dogs and cats, and second to identify important knowledge gaps in veterinary CPR that need to be filled to improve the quality of recommendations and thus the quality of patient care in the future. Cardiopulmonary stress test helps detect coronary artery disease and evaluate the course of medical therapy and cardiac rehabilitation following myocardial infarction, angina pectoris, and myocardial revascularization. com)-- Cardiopulmonary Stress Testing Devices Market - Global Stress Testing Monitor Types Analysis and Forecast 2013-2020, estimates the global cardiopulmonary stress testing devices market to reach nearly USD 5 Billion in 2020, at a CAGR of 9. Increased Coronary Artery Diseases to Drive Cardiopulmonary Stress Testing Devices Market to USD 5 Billion by 2020 - iHealthacareAnalyst, Inc.